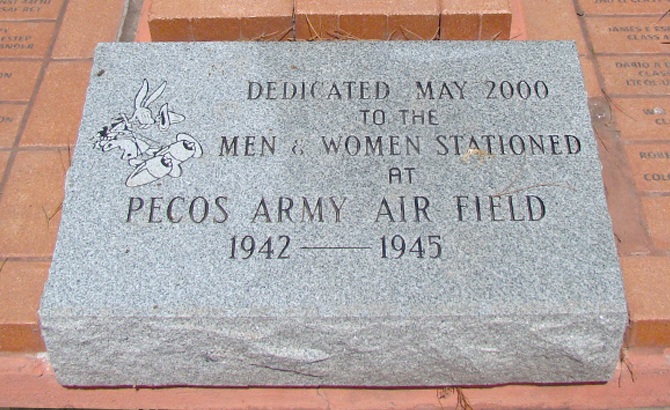 Pecos Army Air Field (PAAF) was activated on July 11, 1942, while still under construction. It first served as the Army Air Force West Coast Training Center as a basic pilot school. At the end of 1943 the field was redesigned as an advanced pilot school. At its pinnacle, on April 30,1944, the field numbered 4304 people, including 482 officers, 972 cadets and student officers, 2218 enlisted personnel, and 604 civilian employees of which 25 were WASPs. PAAF consisted primarily of “theater of operations,” four runways, two large hangars, and extensive maintenance facilities. The first Pecos class, designated 43-A, graduated 133 cadets and student officers after nine weeks of combined ground school and flight training. In all, PAAF produced seventeen classes of basic pilots at roughly one-month intervals, the classes varying from 90 to 528 men. PAAF was closed on May 12, 1945, and was deactivated on August 30. A year later it was returned to municipal control. Over the years part of the field was sold off and repurposed as a park, zoo, and hospital. The airport still uses four runways, an original ramp, and a rotating beacon that have been maintained since the1940s. Today the airport houses a permanent PAAF memorial, open to visitors.